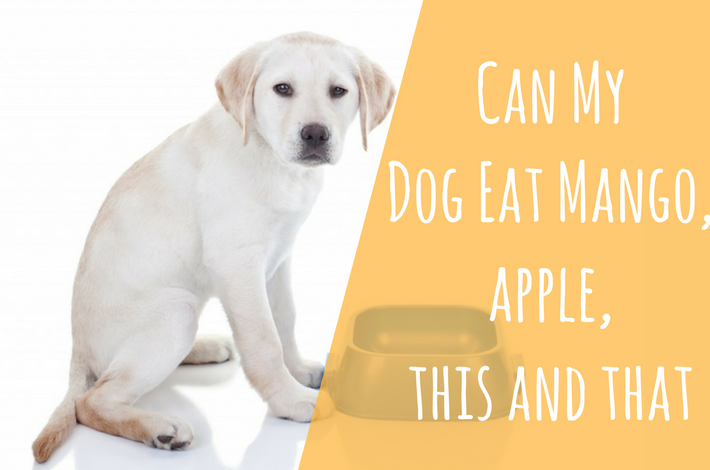 →Can my dog eat mango? Apple? Orange? Having your four-legged friend stare at you with those sad round eyes while you eat something delicious is probably the most hard-to-resist feeling in the world. Our instinct tells us to immediately share the food with our friend, because, well…it’s delicious right? Even if some foods are perfectly good and even healthy for you as a human to eat, it doesn’t mean that they’ll bring the same benefits to your dog. On the contrary, some of the healthiest food choices for us such as green tea or dark chocolate can be fatal for your dog! On the other side, there are many human foods that can serve as a perfect snack for your dog! Don’t forget that a dog should be fed primarily with dog food since it contains all the essential nutrients and vitamins necessary for your friend to have a long and healthy life! In order to help you decide which treats are edible for dogs and which are strictly forbidden, we’ve composed a list of some of the best and worst foods for dogs. Safe to Eat Foods for Dogs​! Chunks of lean meats can be a great treat for your furry friend! One of the most important things to remember when it comes to meat is to always watch out for bones. The myth that “dogs eat bones” is just that – a myth! Even though they might be able to chew and break the bone, small particles of it can often get stuck in your dog’s throat (especially true for cooked bones). This can cause him to choke. Another bad thing that can happen is if a sharp bone piece damages your dog’s intestines. Next, you should make sure that the meat is cooked, so that any bacteria that might be present is destroyed. Follow these bits of advice and feel free to treat your dog with pieces of lean beef, chicken, turkey, etc. Avoid giving your dog bacon and similar fatty meats. Supplementing your dog’s diet with vegetables will allow you to keep him healthy and strong. Vegetables are full of vitamins which will greatly benefit your dog’s health. Carrots, cucumbers, zucchini, asparagus, green beans, potatoes (boiled or cooked plain), celery, pumpkin, squash, sweet potato, spinach, lettuce… all are great choices of doggy snacks! Aside from all the health benefits of incorporating vegetables into your dog’s diet, vegetables can also help him lose some weight. So, if your little ball of fur looks a bit too round, feel free to add some vegetables! One important thing to remember when it comes to vegetables is to never give your dog any form of onion, garlic, leek or chives! Contrary to popular belief, dogs do like fruits and can eat fruits! In the category of fruits, it’s crucial to remember to not give your dog grapes or raisins at any cost! But, apart from these two, any sort of fruit is safe for your dog to eat. Whether you choose bananas, apples, blueberries, melon, kiwis, watermelon, mango, oranges, pineapple, pears, strawberries, peaches or raspberries, your dog will definitely enjoy this! However, when you choose a fruit that has seeds or pits (plums, persimmons, apples, watermelon, oranges, melon, peaches, pears, etc. ), always remember to remove them! Seeds and pits of these fruits can contain substantial amounts of cyanide – a substance that is toxic for your dog! Furthermore, always give your puppy only the “meaty” part of the fruit and remove the peel of certain fruits – oranges, bananas, watermelon, pineapple…you get the gist. When choosing fish as a treat for your dearest friend, always, always make sure that there aren’t any bones left! Salmon (and other similar boneless fish) is a great option to consider since it contains Omega-3 fatty acids as well as many other essential nutrients that will do wonders for your dog’s health! Apart from remembering to take out every single bone, it’s also crucial to always have the fish cooked. Raw fish can contain bacteria, some of which can be fatal to your dog! So, either boil or bake the fish without many additions (best is plain) and then see if your dog likes it! Peanut butter is often one of the most-favored dog treats. Your dog will probably love it! However, some peanut butter brands contain the artificial sweetener called Xylitol – a dangerous substance for your dog! So, if you’ve decided to treat your dog with peanut butter, make sure to always read the ingredients and make sure it doesn’t contain xylitol. The best thing you could do for your puppy is finding an all-natural peanut butter that doesn’t have any additional ingredients except peanuts. Since pasta usually doesn’t contain important nutrients or vitamins, it won’t provide any health benefits to your dog. However, if you do wish to give your dog a bite of those spaghetti you cooked – that’s ok! Pasta as a dog treat should only be given boiled/cooked, and be aware of the additions that come with it. Pasta sauce that contains onion or garlic (even if it’s in a powder form) is not suitable for your dog! Plain and boiled chicken with cooked rice is the best thing you can give if your dog has an upset stomach or diarrhea. So, rice is okay for your dog to eat and it’s not toxic. However, white rice has less nutritional value than brown rice, so choose brown if possible. Even though you are allowed to give your dog rice, remember that this should be considered a treat, since rice is not a proper nourishment for a dog. In fact, all grains are ok for your dog to eat (unless he has allergies), but only in moderate quantities. Eggs are a great source of protein, so they're perfect as a dog snack. However, many dog owners have the idea that raw egg is good for their dog. This is not the case! Raw eggs can contain many bacteria such as Salmonella or E.coli that can ruin your dog’s health. Always boil the eggs (or scramble with only a small amount of oil) before giving them to your dog. Canines can be lactose intolerant, so be careful when giving dairy products. If you do want to give your fluffy friend some dairy, choose yogurt and cheese over milk! Milk can be harder for dogs to digest, while yogurt is easier on the stomach and contains healthy bacteria. The same goes for any milk products, like ice cream, for example. Frozen yogurt with fruits (make sure it doesn’t contain the artificial sweetener xylitol) is always better than milky ice cream! When it comes to cheese, only give small quantities because this is a high-fat and high-calorie food! Other dairy products such as butter should be avoided since they’re extremely caloric. Yes, honey is a healthy occasional treat for your dog. It contains a lot of vitamins (A, B, K, C, and D) as well as antioxidants. Honey is actually a great way to prevent your furry friend from developing allergies later in life. Honey has pollen, so when you give small quantities of it to your young puppy, it builds up his immune system and makes him more resistant to allergies in his adult life. Feel free to satiate your dog’s sweet tooth with honey, but make sure it’s only small quantities. Most people are aware that dogs shouldn’t be given chocolate, and that’s a positive thing! Chocolate contains an alkaloid called theobromine which is extremely toxic to dogs even in small quantities. The darker the chocolate is, the more theobromine it contains. But, make no mistake – even white chocolate contains theobromine! So, do not give your dog chocolate under any circumstances, no matter how much he begs with those sad little puppy eyes! Two extremely dangerous human foods that dogs should never be allowed to eat are garlic and onion. Actually, anything that comes from the onion family, such as leeks or chives is best to avoid! These products can break down your dog’s red blood cells, cause anemia, and even death. Signs of anemia in your dog are pale gums, increased/rapid heart rate, general weakness, collapsing, and even death! Any type of garlic or onion is harmful to your dog, no matter if it’s raw, cooked, powdered, or dehydrated. The symptoms of anemia that present after ingesting these products may not show immediately but after some days or even weeks. If you suspect that your fluffy trouble-maker has managed to eat some garlic or onion, seek veterinary attention and monitor him closely! Even though many people consider raw meat and eggs to be a safe option for dogs, it’s best to avoid this and stay on the safe side. Raw meat of any type can contain many different bacteria which can attack and damage your dog’s health. The same goes for fish and eggs. Hundreds of different problems can occur due to bacteria. The best way to give your dog meat is by boiling or baking it without any additions. Like this, any meat is safe for your dog, just as long as it’s not raw or under cooked. Bones should not be given to your dog at all, neither raw nor cooked (in fact, cooked bones are even worse!). Lately, this has been a huge controversy among vets. However, while there are some that suggest raw feeding formulas and recipes, the majority still disagree. More research is needed on this topic, so for now, it’s best to follow the guidelines and avoid feeding your dog raw animal-based products. You should never give your dog (and all pets in general) any type of alcohol. We all know that alcohol is toxic also for us people, so it’s only logical that it would do the same to your dog. However, you should be aware that it’s much more destructive and harmful for dogs than it is for people. Even the smallest amount of alcohol can severely damage your dog’s liver and brain. This toxic effect of alcohol means that you should pay extra attention to hiding your liquor from your dog. Even though dogs aren’t naturally drawn to alcohol, some mixtures that contain alcohol can be tempting. A perfect example for this is eggnog! Above, we mentioned that most fruits and vegetables are perfectly ok for dogs to eat. Well, avocado is definitely not one of them! All of the components of avocado (flesh, leaves, pit, and bark) contain a toxin called pepsin. This toxin can upset your dog’s stomach, cause vomiting, and difficulties in breathing. The avocado is a perfect example that teaches us never to assume that what’s healthy for us is also healthy for our furry friends. Although they’re perfectly fine and even healthy for us humans, grapes and raisins contain toxins that can be life-threatening to dogs! These toxins can cause permanent liver damage and kidney failure in dogs. This is a seriously dangerous food that a dog should absolutely never eat! Even a few small grapes can be fatal for dogs, so make sure that your dog doesn’t have access to grapes or raisins in your home! As we mentioned before, Xylitol is a type of artificial sweetener that’s usually present in sugar-free alternatives of juices, chewing gums, candy, etc. This sweetener can result in several different detrimental damages such as insulin overproduction, kidney failure, and even death. Always read the ingredients of every human food you plan to give to your dog and make sure it doesn’t contain Xylitol. The reason why you have to do this is that many times, you can find this ingredient in the most unexpected products such as peanut butter, toothpaste, and even some varieties of yogurt. Caffeine and caffeine-like stimulants contain Methylxanthines (or Methylated Xanthines) which can be life-threatening to dogs. This compound can severely affect the nervous system of dogs and can cause heart palpitations, restlessness, vomiting, diarrhea, and in worst cases even death. So, feel free to enjoy your morning cup of coffee but make sure that your puppy doesn’t also dive in! Aside from coffee, make sure that your dog doesn’t have access to tea, cocoa, energy drinks or coke. All these things contain caffeine and can damage your dog’s health. Even though most dog foods and homemade foods contain salt, avoid giving your dog too much of it. We all know that salt can cause thirst and dehydration, and it has this same effect on your dog only much more amplified. Excess salt in your dog’s diet can even result in sodium ion poisoning. The symptoms of too much salt are constantly thirsty, frequent urination, vomiting, diarrhea, tremors, and even seizures and death. So, be careful what type of treats you give your dog. Some examples of inappropriate treats would be salty pretzels, chips or other similar salty snacks. The pits and seeds of all fruits should be strictly forbidden for your dog. This is especially important to remember for pits from peaches and plums which contain cyanide (poisonous for dogs as well as us humans), and seeds from persimmons which can block and damage your dog’s intestines. Furthermore, any type of fruit seeds or pits should not be given to dogs. So, if you decide that you want to treat your dog with fruit, make sure to remove all seeds, stems, and pits (and in some cases peel or bark). Even though your dog can freely eat peanuts or almonds, macadamia nuts are toxic and dangerous! Any food that contains macadamia nuts is forbidden for your four-legged friend. Ingesting macadamia nuts can cause vomiting, muscle tremors and shaking, weakness in the legs, etc. In worse cases, it can even lead to a coma or death. Make sure to secure your kitchen pantry where a dog can easily find many different forbidden foods. We all know that dogs are curious creatures that want to try everything. You know how the dough has to rise before baking the bread? Well, imagine it rising in the stomach of your precious puppy! We definitely don’t want that. Ingesting raw dough can cause severe stomach discomfort and pain for your dog. And as if that’s not enough, when the dough ferments in the stomach it releases alcohol. This can bring the same effects of alcohol poisoning and toxicity. So, even though a piece of bread or a bite of your burger bun is fine, fresh and unbaked dough is extremely dangerous. Even though a good slice of lean beef or turkey is healthy for your pup, fatty pork, sausages, or bacon are not such a smart idea. Even though you might feel sorry that your puppy cannot experience the deliciousness of bacon, these are extremely fatty foods which over time can lead to pancreatitis in dogs. A bite of bacon once a month won’t do any harm, but regularly treating your dog with bacon might leave some consequences. As we can see, many of the everyday table foods that are healthy for us can be extremely dangerous for the man’s best friend. Putting aside the fact that you’ll have less control over how much your dog really eats, constantly treating your dog with human food can pose some more serious threats to his health. While we might avoid garlic only because it will give us a bad breath, it can actually kill your dog. And while milk and coffee are the perfect combinations for waking up in the morning, it won’t be the same for your furry friend. Now that you know all of this, we do understand that accidents can happen. In case you suspect that your dog has eaten something bad for him, closely monitor his behavior over the next few weeks. As soon as you notice something out of the ordinary, bring your pup to the vet! Many of the above-mentioned products can have consequences that don’t show up right away but after some weeks or even months. So, if you really think that your dog has ingested large quantities of food that’s toxic for him (or any other toxic substance in your home), it’s best to seek veterinary help immediately! In this way, your vet can react fast and prevent the food from dissolving in your dog’s system. As a final note, remember that these “human” foods should not represent a large part of your dog’s diet, but rather be considered as occasional treats. A dog should eat well-balanced dog food that will provide complete and proper nourishment. So, follow these tips, stay on the safe side, and enjoy the love and happiness of your healthy ball of fur!